Mr. Mohammad Umer Sharif Shohan, M.Sc. 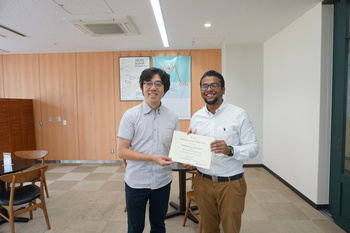 student of University of Dhaka, from Bangladesh has successfully completed IRCMS internship program. He stayed IRCMS for 8 weeks and did research activities under the supervision of Prof. Yorifumi Satou. Congratulations and we look forward to his future success!